Currently we have an xcode (obj-c) application that interacts with a pairing service on an windows server. this works fine, but now the question is how to make that possible with android (java) in Android Studio. Is there any kind of example available? What we finally want to archieve is an pairing system with a 4 digit code like the one with xcode. What you’ll want to do is follow steps similar to those explained at https://docs.remotingsdk.com/IDEs/Xcode/ConnectToServer/, to generate the interface file for Java. you can do this in ROServiceImporter (Mac) or in ServiceBuilder (Windows). You can then use the _Intf.java file in your Android Studio project. Unrelated, you could also consider using Elements (in Fire or VS) for the Android project, as described under https://docs.remotingsdk.com/IDEs/Fire/ConnectToServer/ ;). Actual fire release have the button connect disabled. Any other wat to proceed? press Tab. sometimes the text field doesn’t get validated until then. Thanks. I try everything but don’t work. Neither works browse for local rodl file (do nothing). Im downloading beta release to test. Yeah, you’re right. something is completely broken. I’ll investigate and get it fixed fro Friday. :(. Great! When plan to release next beta? I test that and now the buttons are enabled, but click do nothing… in both cases. or im ding something very bad or don’t work. Connect to server fo nothing. Hmm, it worked for me after my fixes. Can you open Console.app, then try again and see if it shows any error messages from Fire? Connection to the server never works. It gets 15 minutes connecting and hold there. Have no idea why. Connect to RODL works fine. The server is accesible via direct web access. Still can’t make that work. 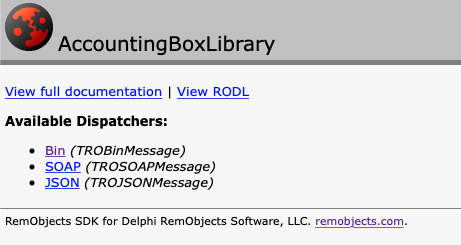 I have the RODL file partitioned in several RODL files (two by module, one for types and one for services used by the one for types). Seems like fire don’t understand that and files to produce the correct into files needed. Can I send the files to support mail? Connection to the server never works. It gets 15 minutes connecting and hold there. Have no idea why. Sure, but I’ll need a bit more explanation what the problem is; ideally a project test case that already contains the RODLs, and steps what do do with it that fails.